Portable Document Format (PDF) is one of the most popular formats for storing multi page text information. Many documents these days are being generated or converted to a PDF format. For most businesses, PDF has become the default document format. It allows to keep data protected from copying, set specific rules of use and read books comfortably on computers. However, sometimes it is necessary to create TIFF copies of PDF files for the further use in mailing, faxing and printing etc. The Tagged Image File Format (TIFF) is a widely-used type of image file. TIFF files use lossless compression, which means that there's no loss in image quality. If you find that you need to convert PDF documents into TIFF images, the process can be slow if you have many files to convert and you have to convert one document at a time. Our PDF to TIFF Converter is the easy to use windows application to batch convert PDF into TIFF. The batch mode permits you to convert thousands of PDF document to TIFF images within split seconds. It does not take much experience to handle it. In order to convert PDF to TIFF, you should select the folder that contains PDF documents, specify the files you would like to convert and just click on start button. It has a robust and user friendly interface, which makes it very easy for even a beginner to convert PDF to TIFF. Save all PDF pages into one TIFF file. Save all PDF pages to separate TIFF files. Supports compressed TIFF (LZW, PackBits, G3 fax, 2-D G3 fax, G4 fax encoding). 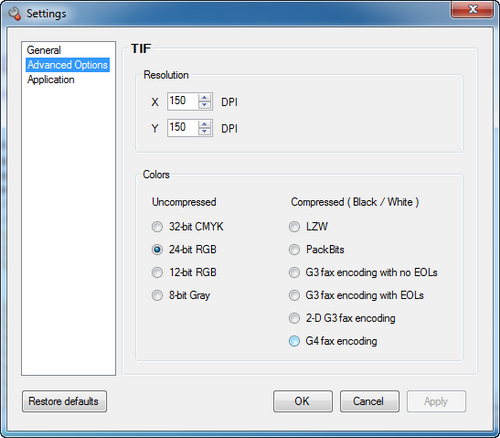 Supports uncompressed TIFF (32- bit CMYK, 24-bit RGB, 12-tib RGB, 8-bit Gray). 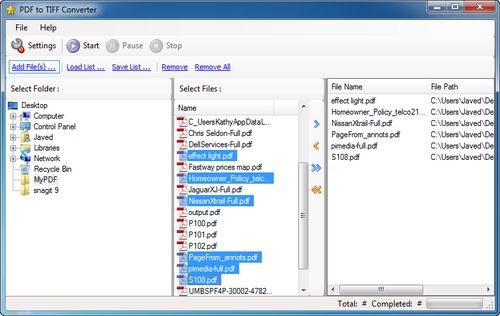 Supports drag and drop of file from windows explorer. Install our PDF to TIFF Converter program to your computer. A free trial of the program is available for download. Select the PDF files that you want to batch convert to TIFF format. Click on Add Files to add PDF files for conversion, you can drag and drop files from the Add Files section or directly from windows explorer. 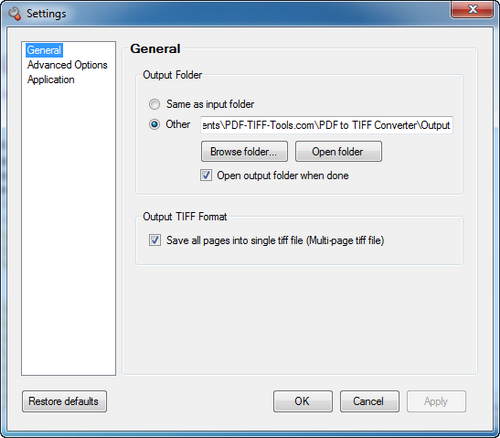 You can change the settings like Output Folder, convert all PDF pages to one TIFF or individual TIFF files. You can also change the settings for resolution DPI, Compressed or Uncompressed TIFF. Now to convert the PDF files to TIFF, click on Start button to begin the batch conversion process. All of the generated TIFF image files will appear in a separate Output folder.